Looking at the two satellite pictures taken back in 1979 and in 2003 for the Arctic, we find a considerable erosion of the Ice Cap. However, upon closer inspection it seems that the melting of the Ice Cap is uneven along its perimeter. In fact, when you look deeper at the area encircled in red, it is clear that the ice is building towards Siberia and is moving away from Canada. At the same time, the strength of the Earth’s magnetic shield has decreased 15% in the western hemisphere over the years from 1850 to 2012. During the same period, the south polarity magnetic pole, in the northern hemisphere, has wandered about 1,100 km (685 miles) into the Arctic Circle. “The rate of the magnetic pole’s movement has increased in the last century compared with fairly steady movement in the previous four centuries”, said Joseph Stoner and the Oregon researchers. The Oregon team examined the sediment records from several Arctic lakes. Looking at the sediment records of the Earth’s magnetic field at the time, scientists used carbon dating to track changes in the magnetic field. They found that the magnetic pole had shifted significantly in the past thousand years. 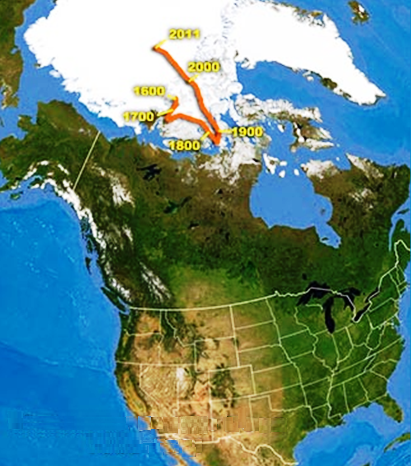 It generally migrated between northern Canada and Siberia, and has occasionally moved in other directions. The rate of shift of the magnetic pole is on the increase and it seems that in the past decade alone, it had moved a distance close to the distance it had moved in the whole of the past century. Comparing the two phenomena, there seems to be a relation between the location of the magnetic pole and the location of ice build up; where both are moving towards Siberia in tandem? 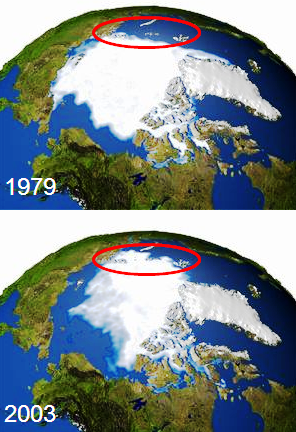 Older ice cap will melt while at the same time new ice cap will form over new location. Melting occurs faster, as the former ice cap has now been covered by a warmer Temperature Belt, but the build up of new ice cap comes from precipitation, and accumulation of ice takes place over hundreds of years, and new ice caps take centuries to fully form. Similar phenomenon is reported in Antarctica, where the ice cap is eroding in the west where the magnetic pole is moving away from and is building in the east of Antarctica, where the magnetic pole is moving towards. Upon tracing the magnetic pole ancient movements together with documented climate conditions at ancient times, it is apparent that the closer we come to the magnetic pole, the colder it gets. Arab ancient texts speak of an abrupt climate change in ancient times. The manuscripts come from ancient texts that describe in detail a bitter cold wave that occurred between the years 900 AD and 950 AD in Arabia. I add that at that time the magnetic pole was in Siberia; as close to Arabia then, as Central Europe close to Canada today, where the magnetic pole is located. The ancient text research has been brought to light by a team of scientists from the University of Extremadura in Spain. The article published describes, how in 900 AD, the territory where it is now Iraq and Syria suffered periods characterized by a very unusual cold, with temperature below zero.. According to Fernando Domínguez-Castro, who was carrying research at the University of Extremadura, the study has brought to light key data that better interpret the current climate change. “We were fortunate to find ancient sources of direct data that are traditionally neglected by many climate scientists” he added. Some researchers think this may presage a magnetic reversal, in which the north and south magnetic poles flip. However, this does not justify why the strength of the magnetic field is weakening. Scientists admit that there are things going on, deep beneath our feet, which they do not understand. I add to that, that there are also celestial changes going on, deep above our heads, which we need to be made aware of. Both types of changes could be inter-related and have profound consequences over life on Earth. For the major source of the thermal energy that reaches the surface of the Earth from the sky, you may click on the Earth Temperature to uncover the mysteries of Earth Magnetic Field in forming the Temperature Belts and driving Global Warming and Climate Change. Interesting article. I came across this looking for research on the ice caps and the position of the magnetic poles. I’m not sure, but I feel that the ice caps act as a superconductor holding the poles in place. Just need to find more data on this. Thank you for your comment. I recommend to read the page titled “Earth Temperature” on the menu of this site. It explain why Temperature Belts (regions of homogeneous climates) are centred around the nearest magnetic pole (Cold Polar belt, Continental belt, Middle Latitude belt, Dry Climate belt and Tropical belt). As the magnetic poles move, so will the Temperature Belts tag along. Where ever the magnetic poles will settle so will new formation of ice cap be formed. Along the history the magnetic poles have moved to Australia, India, Kenya, the great lakes of North America, and so on. Scientists believe that at those times Earth experienced ice ages and was totally covered by ice. My hypothesis is that the Temperature Belts were simply titled from current positioning due to the then movement of the magnetic poles. So there was no Ice Ages at least in the past 100,000 years. Not only the change of the magnetic poles’ locations do not only lead to “Climate Exchange” as green lands become arid and vice versa, but also to changing of Earth Spin Speed. If interested to understand what makes Earth spin and what makes it spin at different speeds, or if the spin is revered or will be reversed, you may read about my hypothesis on the “Earth Magnets” page on the menu of this site. Reading through the other pages an posts on this site, you may be able to put the pieces together to understand the magnitude, speed and frequency of global change. As well as the dates for the next cycle of change. In 1958 Charles Hapgood published a very well researched book. A case for planetary geography being shifted in relationship with magnetic pole positions. The Path of the Pole is the book title and his work holds up well against everything written before or after 1958. For those interested in archeo-magnetic science this is a must read for the scholar or simply curious. The scientific data we have indicates earth’s magnetic field has been in steady decline for more than a hundred years. In that same time period the magnetic pole positions have started an erratic, elliptic geographic movement from first recorded pole placements. Random loops sweeping down across arctic geography and gesturing toward Siberia before returning to the true north position. The same opposite thing is happening at the south magnetic pole. A wobble in the magnetic axis which does not create a wobble in the planetary spin, yet the question is will this happen? Why is the earth’s electromagnetic energy in decline? The earth’s rotational spin remains steady and like a generator produces the magnetic shield which protects the planet from dangerous solar and cosmic radiation, deflecting that radiation around and away from earth’s surface. It may be that global warming is due to a decline in earth’s own magnetic shield protection. It is also possible a geophysical earth shift event is already underway. If a shift event has begun concerns of global warming will become insignificant. Archaeological evidence seems to support the theory of radical earth crust shift events. Shifts up to 30 degrees that alter latitudes of geography and occur so suddenly that areas of the earth surface are quick frozen. There are extinct frozen animals like woolly mammoths all surrounded by a yellowish hydrogen ice. Their protein cell tissue did not explode at point of freeze. A true quick freeze occurred. The animals appear to have suffocated in a short time. Something radical occurred in the atmosphere to lower temperatures so quickly. It froze lung tissue on contact. Food in animal’s mouths and undigested in stomachs is plant vegetation from temperate latitude area growth that means not arctic geography. North Shore Oil explorations drill sites on Alaskan and Siberian coasts have gone down a thousand feet through frozen earth and pulled up frozen tropical species leaf matter from core drill samples. The type of cold that can quick freeze a mammoth is extraordinary and beyond any change of weather as we know it. The cold of outer space. How did it reach the earth surface through relatively warm atmosphere? That is true and there could be 2 possibilities to achieve a sudden shift in climate.. 1) crust movement as most scientists tend to believe as you hinted in your comment and I am not in agreement to that and 2) temperature belts tilting as I explained on the pages of this site. Most people believe that temperature belts; regions of homogenous climates, are fixed in geography. The equatorial belt is the hottest and the polar belt is the coldest. Most people believe that it is so because the geographic equator receives most of the solar energy throughout the year. In my research https://planet-earth-2017.com/heat-not-from-the-sun/ I found out that the thermal radiation received from the Thermosphere onto the surface of Earth is twice that received directly from the Sun. The temperature map at the Thermosphere layer (100km to 800km deep) follows the magnetic poles. Half way between the two magnetic poles the temperature exceeds 2000 degrees Celsius. Atop the 2 magnetic poles the Thermosphere temperature is very low. As the 2 magnetic poles are currently in close proximity to the geo poles, the magnetic equator overlaps the geographic equator and Temperature belts align almost with the latitude lines. I have proved through simple electromagnetic theories and also geological discoveries at ancient times, that there are 2 sources of magnetic fields that emanate from Earth https://planet-earth-2017.com/the-true-source-of-earth-magnetic-field/. An induced field of south magnetic polarity at each geo pole region at the orthographic projection of the Outer Core and a permanent field that is much stronger. The former is emanating from the Outer Core and the latter emanates from the Inner Core. The permanent magnetic poles are not aligned with each other at the opposite sides of the planet, In fact both are currently migrating eastwards. 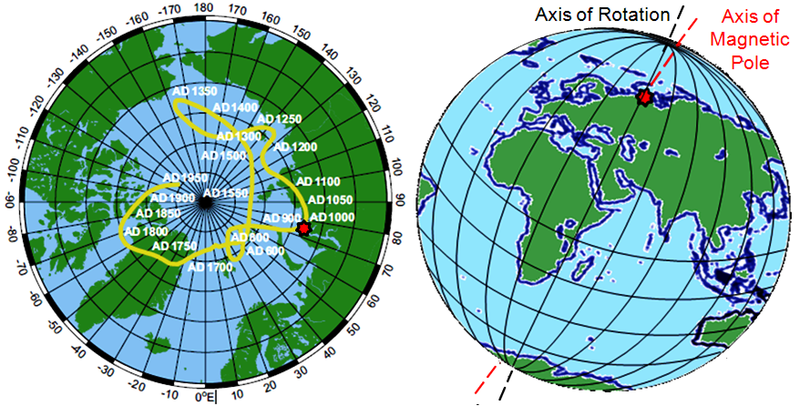 The magnetic poles in the Arctic Circle is moving faster than the one in the Antarctic. At the 17th century Europe went into a mini ice age. At such time the magnetic pole was not in Canada. At that time it wandered in the region bound by 20 to 30 degrees East and 77 to 84 degrees North which made it very close to Norway and Sweden. Arab ancient texts speak of an abrupt climate change in ancient times. The manuscripts come from ancient texts that describe in detail a bitter cold wave that occurred between the years 900 AD and 950 AD in Arabia. Research has been brought to light by a team of scientists from the University of Extremadura in Spain. The published article describes, how in 900 AD, the territory where it is now Iraq and Syria suffered periods characterized by a very unusual cold, with temperature below zero. At that time, the magnetic pole was in Siberia only 3,600 km far from Arabia. In summary: Temperature belts follow the location of the magnetic poles. The Earth has 2 sources of magnetism. One of which is in continuous movement and greatly influences the formation of the temperature belts. As a result of the eastward movement, the distance between the two magnetic poles has increased by 800km in the western hemisphere since the year 1900 . As a result, the mid distance between the 2 poles became less protected, in what is called South Atlantic Anomaly. Charged particles arriving from the Sun such as Protons, can easily penetrate such a weaker field. Colliding at high kinetic energy leads to ocean warming https://planet-earth-2017.com/2015/12/ and release of Methane out of its enclosing Hydrates. Methane bonds with Oxygen to produce CO2 and H2O; both are green house gases! There is an elaborate chain of cause and effect as manifested on the pages of this site and in my book “More Than 60 Minutes- When Earth Stands Still”. While a single page could be limited to a specific specialization, the walk through to all pages can explain the escalation of change in climate, spin speed, and inconsistent variation in sea level(s). The researchers found their answer a few thousand kilometres away. “The bulk of the answer is a deficit of water in Eurasia: the Indian subcontinent and the Caspian Sea area,” Adhikari said. Thank you for your alert of the new NASA research on the drift of the axis of rotation at which I bet to differ. In my research and as explained on the Earth Magnets page of this site https://planet-earth-2017.com/the-true-source-of-earth-magnetic-field/, I came to conclude that although there is twin induced south polarity magnetic fields at the Northern and Southern pole regions due to the Outer Core helically flowing electrons, there is a presence of a stronger dipole magnetic field, and that the source of such a dipole magnet can only be the Inner Core. Under extreme pressure and high temperature, the Inner Core became ductile and its two magnetic poles are not synchronously aligned to each other at the geo pole regions of Earth. In other words, the imaginary line connecting the two magnetic poles does not pass through the centre point of Earth. According to http://wdc.kugi.kyoto-u.ac.jp/poles/polesexp.html, the magnetic pole in the North has moved from 81.0N-109.6W in the year 2000 to 86.4N-166.3W in the year 2016. And, the magnetic pole in the South has moved from 64.7S-138.3E in the year 2000 to 64.2S-136.4E in the year 2016. As both magnetic poles keep moving eastward, it is expected that the centre of gravity of the Inner Core to also move to the east. Such a move could explain why the spin axis has drifted to the east as quoted by NASA: “a massive eastward drift of our axis over past 16 years”. A precise comparison of the eastward movement of the centre of gravity of the Inner Core where density is 13 gm/ cm3 to the rebalance of ice and water where the density is a mere 1 gm/ cm3, could tell which one of us is correct. Could the movement be related to an orbit of the searched for ninth planet? Does maybe reversals are related to this too. I have researched at depth and published onto the other pages of this website what motivates the magnetic poles to shift, the Earth temperature belts to tilt, the permanent and the induced Earth Magnetic fields to emerge, the change of planets spin speed, the different sea levels, ..and so on. Changes in climate, temperature, spin speed, sea level, .. and many more are chained to each other in a cause and effect relationship. They are driven by Earth geo magnetism, which has always engaged in a tug war with the magnetic pull/ push of other planets and cosmic bodies. The escalation of such changes indicates a new planetary entrant to the inner solar system. Reference to geology and ancient text indicates the cyclic visits of such a bodily planet. Some call it Nibiru. Some name it Planet 9 ! I recommend to read the pages of this site as I authored earlier in 2009. I also recommend to review the posts on the right hand side of this site; for they are published as and when a discovery that ascertains my research model has emerged. Thank you for writing the article. I was telling others about globe warming not being exactly what we think. After all we are just now in this age of technology, have the ability to study the changes. We have just dealt with the disasters in the past as something that just was. However, now with technology and advance sciences we scar ourselves into thinking that Global warming is new and that the melting of the ice caps is bad. The problem is we think of our past explores and map makers as being dumb. For Antarctica is covered in ice but old maps that the ancient explores made actually mapped an island chain and large mass that is now covered in Ice. Map makers had to be accurate their lives depended upon their accuracy if they made errors they could lose their main source of income or even their lives. Therefore if the shifting of the polar caps means those alleged islands actually were warm enough for a ship to travel that route in the past our research of Antarctica will actually will bare more fruit. Antarctica will be revealed and just think of civilizations that may be uncovered due to the ice melting. Therefore, I am glad to have found this article, because I thought it was something I remembered vaguely hearing about in a college Earth Science course. As for needing more pull on being able to explain this event. I know the rock layers may tell some of the tale no matter which Genesis Theory of the planet one claims. And to truly find out maybe the technology isn’t there yet maybe a new science hasn’t been discovered yet due to the lack of technology. However, one can’t deny that there is something going on with our pols and that’s why our seasons are out of the natural order for things. I find the only thing that makes since is the changing of pols. 3- Allowing more charge particles arriving from the Sun, mainly Protons to penetrate the magnetic field and reach the Earth surface, bombarding the ocean at such high kinetic energy and causing the oceans to warm and Methane Hydrates to set free, consuming sea oxygen specially along the continental shelves where most Methane Hydrates reside between 0 and 500 m deep and spreading into the air consuming more oxygen. CH4 and O2 would act to produce CO2 and twice H2O. Both are green house gases leading to increase in global warming, increase precipitation https://planet-earth-2017.com/2015/12/ and drop in the Oxygen level https://planet-earth-2017.com/2016/09/. Fossil fuel consumption may not be the culprit after all. 4- Increased precipitation along with increased temperature could lead to increase snow fall specially in areas where bitter cold did not allow snow to form and fall such as Green land and Canada. Dear Niazi, could you explain the Antarctica figure and those marks with the years 1909 tru 2005 ? Is that the magnetic pole position ? You may refer to World Data Centre for Geomagnetism in Japan, which tells the magnetic poles locations starting the year 1900. In fact, I combined readings from WDC for Geomagnetism in Japan and National Oceanic and Atmospheric Administration in the USA, to find out the magnetic field intensity at each location of the magnetic poles across the years. I found out that the magnetic field intensity dropped by 4% in Antarctica and by 6% in the Arctic over a period of 100 years. Both poles are moving eastward and distance amounting to 500 miles (800 km) displaced the 2 magnetic poles over a period of 100 years when measured across the Atlantic. You will find more at the posts I added to this site/ blog pages at the right hand corner !